Your calls are working! Sabal Trail’s allies failed three times to whip up enough votes to pass this travesty. Now please keep calling your state legislators and ask them to stay strong voting against SR 954 until Sabal Trail and Transco easements are taken out of it. It’s currently postponed until next Tuesday, March 22nd, so there’s time to call them through the weekend. If Georgia Power, the EMCs, and GDOT want their easements, they should also be helping us strip Sabal Trail and Transco out of this bill. 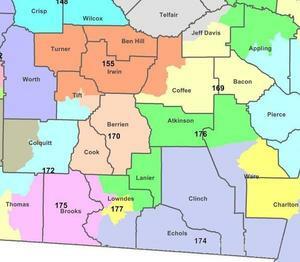 A fracked methane pipeline drilling under Okapilco Creek and the Withlacoochee, Ochlockonee, Flint, and Chatthahoochee Rivers is no advantage to anybody in Georgia. Or the Suwannee River in Florida: if you’re in Florida, you probably know somebody in Georgia you can ask to call their Georgia legislator. 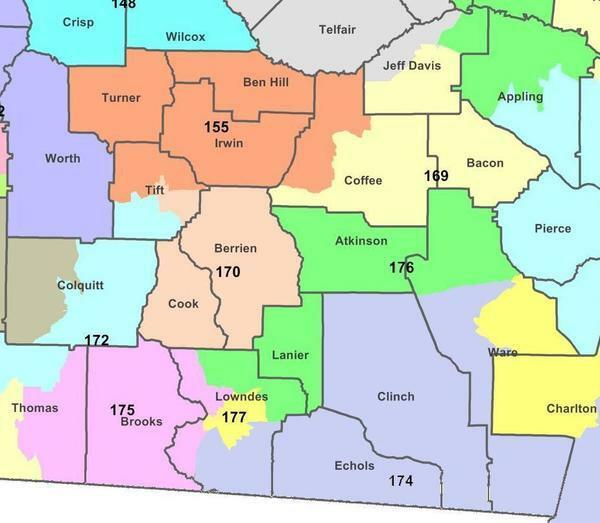 Or here’s a handy list of Georgia House members in WWALS territory, extracted from the Georgia House website, with in boldface those whose district is in the direct Sabal Trail path or who represents the seat of a county that is. Please call your legislator whether or not the pipeline goes through their distict. They may have lucked out this time, but what about the next pipeline invasion from Texas? And we need all the votes we can get right now to fight off this one. Update 2016-03-18: Added some missing reps.
Sabal Trail (a project of Houston-based Spectra Energy) is a methane frack-gas pipeline that would run from east central Alabama to south-central Florida. Multiple route choices exist. The company has chosen one, despite massive amounts of public objection, that maximizes the public and private impact. The Federal Energy Regulatory Commission (FERC) has granted a permit for the particular one the company wants, one which that places a large number of Georgian’s private property under threat of (federal) eminent domain, for private profit. The FERC permit process is under appeal by property owners and advocacy groups. The pipeline still does not have several major state and federal permits (water quality, air, and wetlands). Yet the Deal Administration seeks to go ahead and give the project easements under several major Georgia rivers, including the Chattahoochee, Hannahatchee Creek, the Flint, the Ochlockonee, and the Withlacoochee. Local legislators kept these easements out of the original annual Senate Resolution to convey property easements (SR 954 this year, 2016), but pressure from the Governor’s office had them inserted in the House Committee. The proponents of this early granting of the state easements claim we “must” do this because “they already have their permits” and “we would have to defend a large lawsuit”. Maybe. But, they do not have all of their permits, and, more to the point, why would the state of Georgia not wish to defend a lawsuit that protects our private and public property? Particularly since the same Administration has vigorously opposed an oil/gas/diesel pipeline is east and coastal Georgia, protecting citizens from the use of state eminent domain, including using not only permitting power, but defending the action in court. Meanwhile, a bill is moving through the legislature to examine the proliferation of pipelines and the use of eminent domain to place them. Methane frack-gas lines are regulated in a different way from other petroleum products. FERC has the sole power, under an act passed in the 1940s to maximize much-needed defense manufacturing, to grant the power of eminent domain. But World War II has been over for a while. So has the Cold War, in case that was justification. And, because of the way the law is structured and the way FERC operates, there are no federal or state direct remedies for this abuse of power. All of which sometimes leads folks to conclude that it is a “done deal”. Yet, the states do have tools they can use: air permits, water-quality permits, and river-bottom easements. Georgia should use them. The Deal Administration should be defending private property rights, not rushing to give them away to a Houston-based company and their Florida investment partners. Sabal Trail will destroy invaluable agricultural areas, hunting lands, fish habitat, wildlife, wetlands, and working forests. The pipeline will not benefit Georgia citizens — all of the methane frack-gas will be used in Florida or exported for profit— the recent “announcement” of “taps for GA” is just that: recent. This announcement was made in the heat of the fight. The investors in the project include Governor Rick Scott (Florida). The pipeline is not needed — energy demand is decreasing and energy efficiency and renewable energy can meet any additional demand. Methane frack-gas pipelines are not safe — explosions and fires repeatedly have caused extensive property damage, personal injury, and death including millions of dollars of damage by Spectra Energy, one of Sabal Trail’s owners. See the photograph, taken in May of 2015 in downtown Little Rock, Arkansas. The high-pressure release was from one of Spectra Energy’s pipelines, under the Arkansas River. Sabal Trail’s preferred route unjustifiably runs through the most populated area of southwest Georgia and the poorest region in the state; and, the pipeline does not have to run through Georgia at all. Sabal Trail’s preferred route runs through miles of unstable karst terrain and sinkhole-prone areas resulting in a high danger of pipeline collapse, explosion, fire, and contamination of drinking water supplies. Sabal Trail’s preferred compressor station site is unjustly located in a populated African-American residential neighborhood and will pollute Dougherty County’s air. Profit for Spectra Energy of Houston, Texas is no reason to drill through under Okapilco Creek, the Withlacoochee River, and the Suwannee River, or through the closed Lowndes County landfill, much less to take easements from local landowners through eminent domain. p> Urge your House Member (Representative) to vote “NO” on SR 954. Send it back to committee to have these premature easements stripped out, so that the good language for other needed projects can be passed, and the taking of private property and our natural resources for the profit of a company based in Houston is blocked. This entry was posted in Aquifer, Pipeline, River, Solar and tagged Aquifer, Brooks County, Colquitt County, conservation, FERC, Floridan Aquifer, Georgia, House of Representatives, Lowndes County, north Florida, Okapilco Creek, pipeline, river, Sabal Trail, solar, south Georgia, Spectra Energy, SR 954, Suwannee River, Transco, Transcontinental Pipeline Company, watershed, Withlacoochee River, WWALS, WWALS Watershed Coalition on March 17, 2016 by jsq.